There is no road from San Pedro de Atacama, Chile to Uyuni, Bolivia, but there is a way – dirt road through the Atacama Desert. One should be a genius of GPS to navigate if decides to go by himself. 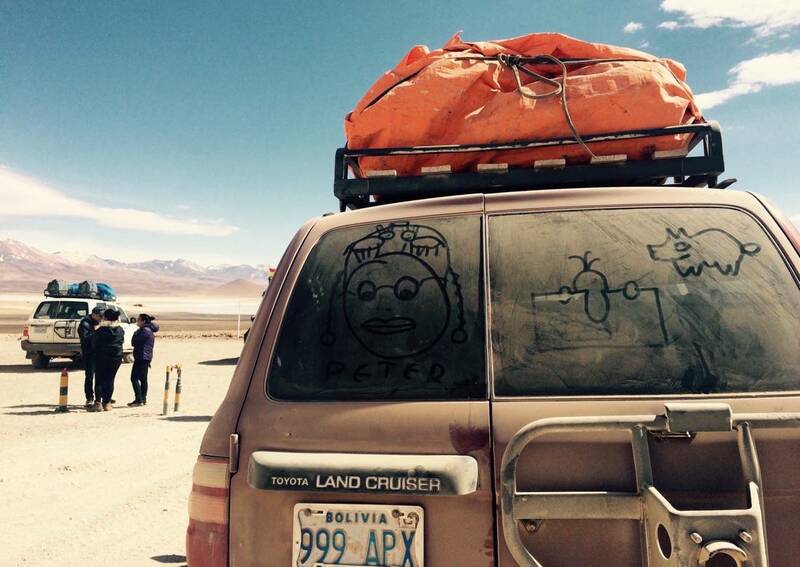 Tour agencies organise 4×4 tours from San Pedro to Salar de Uyuni. There are two things to think about before going – the Bolivian visa and a Dinosaur toy. Look at that barn in the middle of nowhere. If you are US/EU citizen, then fine. The others, who need visas, will pay $95. Yes, US dollars, not bolivianos. Well, in our international group “the others” was just me. I read that no need to go to the consulate, you can buy visa when cross the border for $10. The officer told yes, $10, but not in the desert, and pasted a stamp into my passport. We were driving through the volcanoes, geysers, and pink-flamingos-lakes. On the third day we reached Salar de Uyuni and that was a place when you need your rubber dino. Our drivers did not, but our driver did kept the whole box of monsters in his trunk, so we could take funny pictures, playing with prospective. That where you will see a lot of flamingos. Further, next day, you will see them closer. It’s a very special island in the middle of Salar. Those going from Chile to Bolivia meet sunrise there and those going opposite direction, from Bolivia to Chile, come to sunset.